"Player who leads the League in points at the end of the regular season." The current holder is Nikita Kucherov of the Tampa Bay Lightning. The Art Ross Trophy was presented to the National Hockey League (NHL) in 1947 by Arthur Howey "Art" Ross, former General Manager and head coach of the Boston Bruins and Hockey Hall of Fame inductee as a player. Elmer Lach of the Montreal Canadiens was the winner of the first Art Ross Trophy, which was awarded at the conclusion of the 1947–48 season. Players from the Pittsburgh Penguins have won the trophy 15 times (all within a 26-season span from 1987–88 to 2014–15); the Montreal Canadiens, Edmonton Oilers and Chicago Blackhawks are tied for second, as players from those teams have won it nine times each. Although Joe Thornton, winner from the 2005–06 season, started the season playing for the Boston Bruins, he finished with the San Jose Sharks and the award counts for the Sharks. Therefore, Boston Bruins have seven players winning the trophy, fifth overall. From 1963 to 2001, Marcel Dionne and Bryan Trottier were the only single-time winners of the scoring title, while Stan Mikita, Phil Esposito, Bobby Orr, Guy Lafleur, Wayne Gretzky, Mario Lemieux, and Jaromir Jagr had won it on multiple occasions. For two decades, from 1981 to 2001, only three players won the Art Ross Trophy: Gretzky, Lemieux, and Jagr. The streak ended when Jarome Iginla won the trophy in 2002. 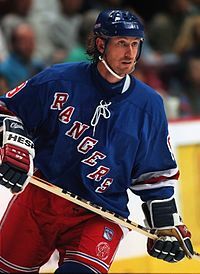 Gretzky has won the trophy ten times, including seven consecutive, during his 20-year NHL career. Gordie Howe and Lemieux have each won it six times, while Esposito and Jagr each have five. Jagr, from the Czech Republic, has won the award the most times by a non-Canadian. Patrick Kane is the only American born player to win the trophy, doing so in 2016. 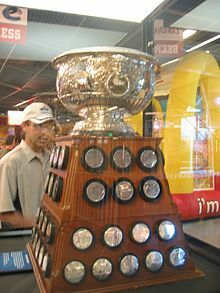 Gretzky is the only player to win the trophy for more than one team, while Thornton is the only player to win it while playing for two different teams in one season. 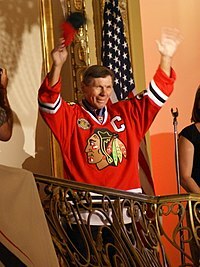 Stan Mikita is the only player in NHL history to win the Art Ross, Hart, and Lady Byng Trophies all in the same season, which he did twice (1966–67 and 1967–68, with Chicago; Gretzky, Bobby Hull, and Martin St. Louis all won each of those awards at least once and won a combination of two of them in the same season, but never all three together). 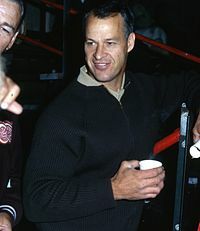 Orr is the only defenseman to win the scoring title, doing so in 1970 and 1975 with Boston, and in 1970 he became the first player to capture four individual awards in a single season as he won the Hart, Norris, and Conn Smythe Trophies that year as well. In 2007, Sidney Crosby became the youngest player to win the Art Ross Trophy at age 19, and also became the youngest scoring champion in any major North American professional sport. At almost twice Crosby's age, Martin St. Louis became the oldest player to capture the Art Ross at the age of 37, also having the longest gap between scoring titles (nine years). 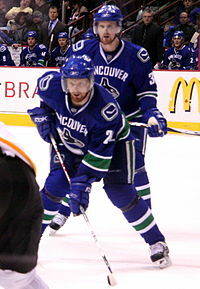 Henrik and Daniel Sedin are the only siblings to win the award, in 2010 and 2011, respectively. Since 2001, only four players, Connor McDavid, Crosby, Evgeni Malkin, and St. Louis have won the award more than once: Crosby in 2007 and 2014, Malkin in 2009 and 2012, St. Louis in 2004 and 2013, and McDavid in 2017 and 2018. McDavid and Gretzky are the only players to win multiple Art Ross trophies before age 21. Scoring ties happened in the 1961–62, 1979–80, and 1994–95 seasons, all of them being decided by the first tiebreaker of scoring more goals. In those respective seasons, Hull won over Andy Bathgate, Dionne over Gretzky, and Jagr over Eric Lindros. The NHL's award to recognize the leading goal-scorer, the Maurice "Rocket" Richard Trophy, does not have a tiebreaker, allowing multiple winners to be recognized in any one season. Bold Player with the most points ever scored in a season. ^ a b c "Art Ross Trophy". National Hockey League. Retrieved August 20, 2007. ^ "Bobby Orr – Biography". Legends of Hockey. Retrieved September 19, 2007. ^ Aykroyd, Lukas (April 11, 2011). "Daniel Sedin wins Art Ross". International Ice Hockey Federation. Archived from the original on October 19, 2012. Retrieved April 17, 2011.